Amazon.com Price: $10.00 (as of 02/04/2019 14:00 PST- Details)	& FREE Shipping. Many out there have heard the word ‘Visa’ before at one point or another. Surprisingly, this word ‘Visa’ is accompanied with so much uncertainty and doubt in the hearts of many, especially when it is linked to ‘advanced countries’. However, contrary to the belief held by a large majority of people, a visa isn’t really a big deal and can be easily gotten to access any country in the world (as long as they accept visitors). There are many nitty gritty procedures & steps which must not be overlooked when requesting for a visa to any country in the world. Many folks that overlooked these steps in their quest for visa approval either ended up in frustration or were seriously defrauded. 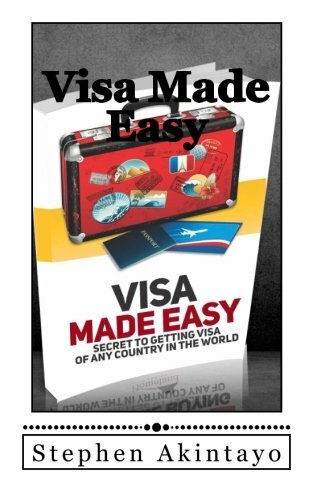 In this book, I’ll be sharing with you the diverse pitfalls you must avoid when applying for & seeking for visa approval, & the simple but necessary steps to take to obtain your visa to any country in the world without stress. You are just a book away from obtaining your desired visa.